Cutie Patootie: Miss HasBrouck, can I introduce you to someone named Bob? She then showed me an invitation she had made for her upcoming birthday party. She pointed at the creature on the front (see below), indicating that he was the aforementioned Bob. Miss H.: He’s cute! What is he? 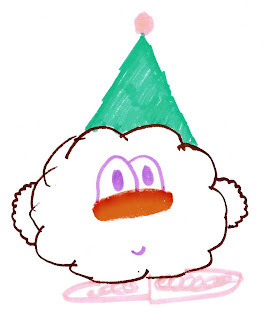 A little cloud? Cutie Patootie: Uh, no. I don’t think so. She stood there thoughtfully for a moment and then said: He’s a party animal. Nice. I like your anonymous naming method for your students too.